In a recent demonstration of the technology, NASA sent a selfie from Antarctica to the space station, making numerous stops along the way. 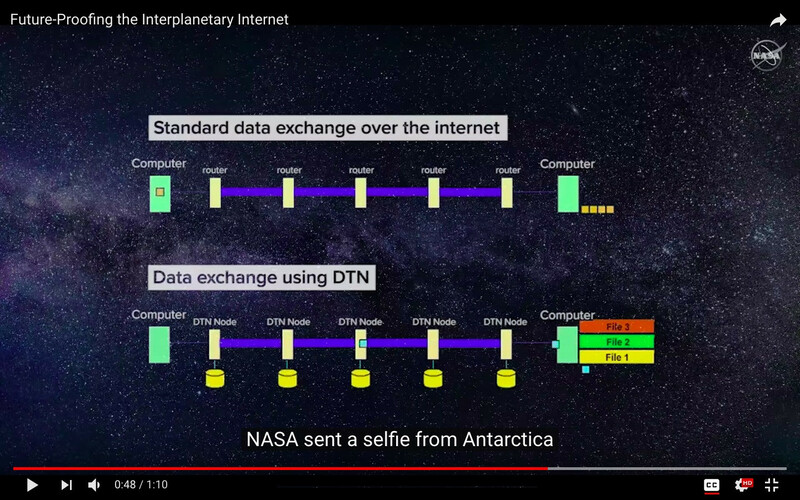 This demonstration showed how NASA’s communications engineers are future-proofing the networks of tomorrow, ensuring that one day, the interplanetary internet can become a reality. I'm not sure what a "NASA selfie" looks like, but I'm curious about the event. How many nodes were used to get from Antarctica to the ISS and what were they? Starting at McMurdo, DTN software on a mobile phone sent the picture on its journey to the International Space Station. The bundles traveled from the McMurdo ground station to NASA’s White Sands Complex via the Tracking and Data Relay Satellite (TDRS). Then, a series of DTN nodes forwarded the bundles to NASA’s Marshall Space Flight Center in Huntsville, Alabama, which is the access point to the operational space station DTN network. That's a series of Internet connections through store-and-forward DTN servers. most likely the connections were terrestrial fiber. The bundles were forwarded to the space station via another TDRS link where they were then routed to the Telescience Resource Kit (TReK) demonstration payload. That's an uplink from Marshall through one or more TDRS satellites (see above) to the DTN test equipment on ISS. The final DTN node extracted the picture data from the DTN bundles that originated from Antarctica. The payload reassembled the original picture and displayed it onboard the station. It's a mix of terrestrial and space nodes and links. The terrestrial DTN nodes between White Sands and Huntsville aren't "nodes" in the way we think of e.g. "Deep Space Network node": big communications complexes. Rather, they're probably research servers running test DTN software to act as the DTN equivalent of an Internet router: The thing that's responsible for the next step on the way. 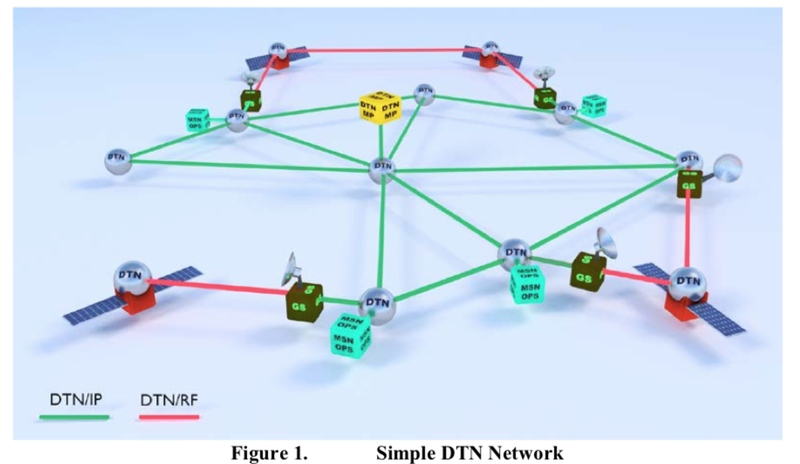 The basic idea behind the DTN is that to build a disruption tolerant network, you can't rely on any specific link, or even a specific topology of links. The nodes at the bottom of the figure in the Question have disks attached because DTN nodes take responsibility for the bundles (message parts) that they receive; they hang on to them and attempt to deliver them despite disruptions that might take a while. The DTN nodes also attempt that delivery via multiple routes, perhaps not knowing which will succeed and when. (Even the choice of routing algorithms is still in flux) In some cases, they might not even know by what specific route the delivery was accomplished. Without looking at the logs, it might be that nobody knows which terrestrial nodes actually handled the deliver. Not the answer you're looking for? Browse other questions tagged iss nasa communication tdrss or ask your own question. Does the TDRS user segment ever provide network functionality beyond being “customers”? What is the modulation technique and what is the coding technique used to send information from the New Horizons spacecraft? What are the “NASA research assets” at Thule that were not recently destroyed by a meteor?